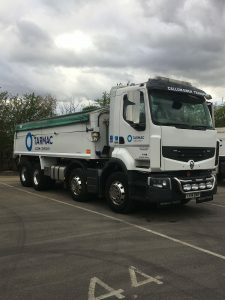 I, Callum Ewen, started Callum Ewen Transport on 4/04/2016 as a Sub contractor to Tarmac, based at Harper Lane, Radlett, delivering asphalt and aggregate. I currently have one Tarmac spec tipper and one employee, however I am currently in the process of expanding and will soon be getting a second tipper and an additional driver. In order to reduce Fuel use, myself and my driver plan our routes where possible to ensure the most fuel-efficient route is being used. The new Lorry will be a Euro 6 which is more economical and more environmentally friendly. Myself and my driver are very conscious of the importance of reducing fuel, CO2 emissions and NOx. I have considered the impact of the above when making enquiries into my second Lorry to make sure these levels are reduced where possible, the new lorry will be Euro 6 and have features included so that the drivers will be more aware of how they drive to try and reduce these levels. The Euro 6 Lorry has had the telematics option added, where things such as harsh accelerating and driving style can be monitored. I also monitor this by using the performance management tool that is available through FORS. Myself and my driver have not received any transport related fines or charges, however with the training and information provided by FORS such as vulnerable road users and safe urban driving through e learning we can ensure that we maintain this and adhere to the best Road Safety practice. Prior to getting my own Lorry and becoming Callum Ewen Transport, I drove for another Sub contractor within Tarmac who at the time was FORS Bronze accredited. FORS was already an established and valuable accreditation that all hauliers and their drivers were encouraged to adhere to by Tarmac at the time I joined. I have undertaken a number of training sessions and courses provided by FORS and I became a FORS practitioner in December 2015. I knew that when I started Callum Ewen Transport it was important to continue adhering to FORS and to obtain my own FORS accreditation as it would help us to achieve best practice and benefit us by providing valuable knowledge and support to myself and driver. It is also an invaluable recognition of high standard that many contractors are looking for. Callum Ewen Transport undertook Bronze FORS in June 2016 and passed first time with a promisingly high score, it was encouraging to know that I was working to the high standard required, I was advised during the Bronze audit that my portfolio and information was already working towards a Silver standard and was advised to maintain the level to which we were currently working. I decided that having only been running independently for only a few months it would be advisable to wait until I had been running longer in order to have maintained a more accurate overview of my running data. Although the accreditation remains valid, I was keen to progress onto Silver FORS and felt confident that myself and my driver where working to a Silver standard. We therefore undertook FORS Silver in August 2017 and passed. Achieving FORS Silver showed me that I am complying with the Industry Standards and that I was running an efficient company. I am now eager to achieve FORS Gold to know that we are running at the highest possible standard and continuing to improve our way of working. We have really made the most of the available resources and facilities that come with being registered with FORS such as undertaking CPC classes for Safe Urban Driving and using the driver licence checking tool. I also became a FORS Practitioner in 2015 following attending 10 Workshops including Collision procedures and analysis, managing driver fitness and health, reducing Fuel use and minimising environmental impact. Attending these workshops helped me gain a better undertaking and improved my knowledge to ensure I could incorporate this information into better working procedures. We also received work books throughout the workshops which have become a helpful source of reference. I have found the performance management tool helpful as it produces clear information on fuel usage, CO2 and NOx. The graphs show me clearly how we are running and I am able to use this tool to identify If changes are required. “I feel that I have a better knowledge and understanding of the industry as a whole as a result of the courses we attend and the guidance we receive from FORS.” Callum Ewen – Director. One of the Key benefits of being FORS registered is the guidance and further knowledge available via courses and workshops. I have attended all ten practitioner workshops, I have also completed Safe Urban Driving and Vulnerable Road Users as well as all of the e-learning modules. My driver has also undertaken Safe Urban Driving 1 and 2 and is currently working his way through the e-learning courses. All of these things have improved our knowledge and overall improves the way we work. The audits ensure that we keep paperwork and training regularly monitored and up to date. This also builds confidence when passing audits and progressing to the next level as we are reassured that we are working to a high standard, it is reassuring to know that if improvements were required in certain areas that guidance would be received from FORS during audits to then make the appropriate changes. I ensure the Lorry is regularly maintained to ensure that it runs as efficiently as possible. I have also considered how we can improve the economical running of the Lorry when looking into getting my second Lorry, I have chosen a Euro 6 which has a number of features that will improve efficiency and noise pollution. I use the performance management system to record and monitor our readings. Driving standards are also monitored through this tool and the Tachograph systems. There are two reasons why I have been keen to progress to FORS Gold, the first is I feel that I have a better knowledge and understanding of the industry as a whole as a result of the courses we attend and the guidance we receive from FORS. It also reflects a high standard of work which customers are understandably looking for. The second reason is Tarmac encourages all their sub-contractors and drivers to progress through the FORS accreditations and achieve Gold, as such they have implemented an allocation of work based upon the accreditation each Sub contractor has. Therefore Gold are first priority, then Silver etc. I have worked hard to achieve what I have and want to continue to improve the way we work and the service we offer our customers. The table below shows that we have been able to increase our MPG by an average of 10 % MPG from last year, where possible we will continue to maintain this and improve further. Driver health and fitness review – I have Health declaration forms which have been completed by myself and my driver and will be completed by any future drivers, I have included the forms used in this portfolio. I also undertake regular eye sight checks with my driver and encourage communication regarding any health issues. Any health and fitness concerns will be followed up with a GP if required. Strategy for recruiting drivers – I am currently in the process of employing a new driver and have included my processes that I would follow to do this. I provide all training required to get the driver confident and up to a high standard. Noise assessment – I have ordered a Euro 6 which will be more economical and will overall be a quieter vehicle. An example of how we take into consideration Noise and disruption is when we are working on a Residential road at night we turn off reverse beepers and left turn alarms to minimise disturbance. Washing the vehicle is done at the operating centre where the facilities used are up to date to ensure they are noise efficient and effective. Modal shift and alternative vehicles – Tarmac use Trains to move the majority of their Raw Material, we then transport it to areas not accessible by train, reducing road usage further is not currently possible however is something that I am mindful of as a company and will make changes where possible. Whilst there is not an alternative option, we continue to plan our routes methodically to reduce fuel usage, noise and pollution where possible. Electric and alternatively powered vehicles are not currently an option but something that will be looked into and consideration given to each time I replace or upgrade a vehicle. As a company, my plans for the future are to continue to expand and improve and to maintain a high standard by updating and maintaining my FORS accreditations and undertaking future courses available. I have taken a lot of time and consideration when choosing my next Lorry to ensure It is more economically friendly, fuel efficient and overall high quality to ensure I carry out my work to the highest possible standard. I will continue to ensure my driver and myself are fully up to date with processes and courses and to maintain regular Health and Fitness checks to ensure we can continue to work safely and in a happy working environment. Eventually when alternative fuel vehicles become available I will consider these options when replacing my current trucks and If I continue to expand. Becoming Gold accredited will be a huge achievement, FORS is a highly regarded accreditation and is therefore something all sub-contractors should strive to achieve. The achievement of FORS accreditations demonstrates a high knowledge of the field we are working in and shows that we dedicated to being the best. I also believe that by working hard and achieving the highest level of FORS demonstrates my passion for my business and wanting to work at the highest possible level and standard. This also means that I am respected in my field and therefore feel able to make suggestions of improvements and know that my feedback is taken on board. Once Gold accreditation is achieved I will continue to maintain that standard and always look to FORS for ways to improve further.